The National Safety Council Congress & Expo is the world’s premier annual event, bringing together 14,000 safety, health, and environmental professionals. 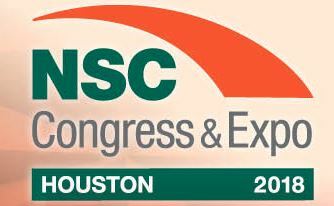 Each year, The NSC Congress & Expo puts you at the cutting edge of trends, products, ideas and insights advancing health and safety at work, at home and on the road. For more than 100 years, professionals have turned to this safety conference for industry-leading technology, education, networking opportunities and the tried and true products and services needed to stay at the forefront and remain competitive within the industry.